Preheat oven to 350. Slice baquette into 1/4-1/2 inch slices on an angle. Brush each with a light layer of olive oil and gently press slices into mini-muffin cups. Bake at 350 for 7 to 9 minutes or until crisp and lightly browned. 1. 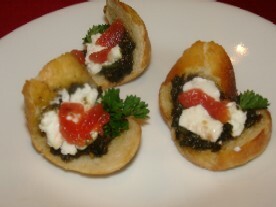 Drop 1/4 tsp of pesto into each crostini cup. Crumble goat cheese on top of pesto and sprinkle with diced tomato. 2. If serving warm, place filled crostini cups back into the oven for approximately 8-10 minutes until the cheese begins to melt. Garnish with small sprig of parsley and serve. 3. If serving at room temperature, garnish with small sprig of parsley and serve.